Reference number for this case: 16-Oct-54-Briançon. Thank you for including this reference number in any correspondence with me regarding this case. AVIGNON (C.P.) - A mysterious device appeared above the sky of Vaucluse in the afternoon of yesterday, and was seen by the observatory of the Mont Ventoux National Meteorological Office. The machine was of unusual shape among all those seen in recent weeks. 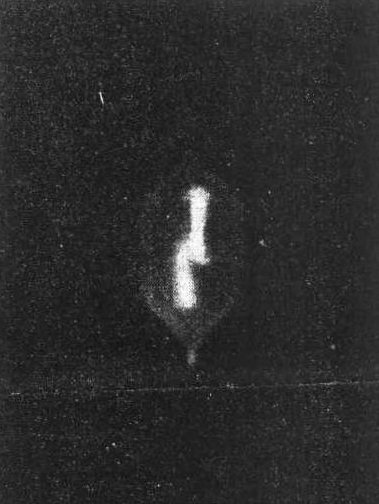 It was neither a saucer nor a cigar, but a cylinder terminated at both ends by a cone, and one of the cones bore something resembling an antenna. The flying cylinder moved vertically and about 4,000 meters above sea level (about 2,000 meters above the Ventoux), going from west to east. It disappeared towards the Alps around 4:45 p.m.
Mr. Batard, a meteorologist observer at the Ventoux, himself saw the mysterious machine and described it to us. It seemed at times to be transparent and of an undefinable material. "What do you think it is?" We asked him. - Probably a remote-controlled sounding machine. "Coming from where?" From the earth? - This is my opinion. "Do you believe in the Martians, Mr. Batard?" - Personally not at all, until proven otherwise. Early in the afternoon, the balloon, pushed by a more violent wind, was heading east. It was possible to see it from Briançon, Aiguilles and Barcelonnette. It seemed to ascend the valley of the Queyras. At 6 p.m. it was no longer seen from Gap, and Dr. Dieulot, a medical adviser to the Social Safety, who had already observed the craft on Thursday, noticed that it was the same balloon. 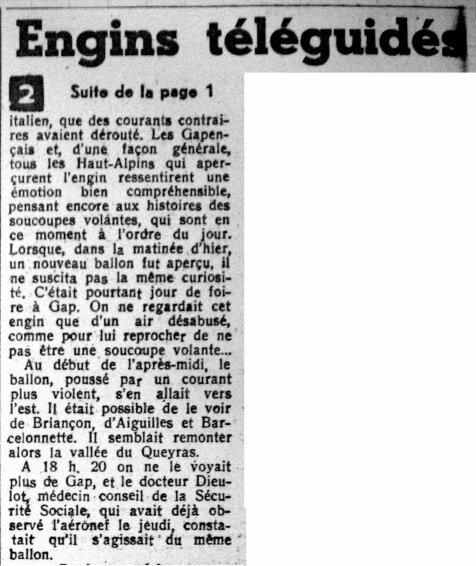 [lm1] Article in the regional newspaper Le Méridional, France, pages 1 and 4, October 17, 1954. 1.0 Patrick Gross February 2, 2017 First published.